It’s unmissable. 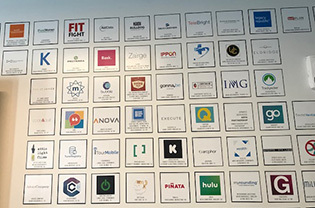 Right inside the Alan B. Miller Entrepreneurship Center located in the Raymond A. Mason School of Business, sits logo after logo, printed on one of the center’s walls. Each logo represents a company founded or led by William & Mary alumni, and if you get close enough, you can see their names and majors. The wall was deliberately placed in the middle of the center as a continual reminder that William & Mary has a rich history of alumni entrepreneurs. The names aren’t limited to entrepreneurs who graduated from the business school; all alumni who own businesses are eligible. It’s also an invitation to current students who pass through the area, encouraging them to one day add their own name to that wall. “The goal is to educate, inspire and support students in developing the skills and the mindset of an entrepreneur,” said Graham Henshaw, executive director of the Entrepreneurship Center. Henshaw has been with the center since its inception in 2012, overseeing a wholesale transformation that expanded its reach beyond the business school and opened up opportunities to the entire student body. He and marketing professor Scott Swan even wrote an interdisciplinary minor on innovation and entrepreneurship that launches this fall and will be open to all undergraduate students. Among the nearly 300 students involved in the Entrepreneurship Center, almost half come from outside the business school, and over 20 majors are represented. That diversity of thought reflects a new, innovative educational approach at the center, equipping students with an “entrepreneurial-thinking toolkit.” Entrepreneurship, they say, is a full system of thought that involves learning how to fail wisely, to make small bets and to identify the right problem, not just the right solution. In that way, entrepreneurial skills are useful for students pursuing non-business majors, just like skills learned in non-business majors also help students who become entrepreneurs. Ultimately, while the goal for each student involved with the center is to add their name to its wall, the alumni whose names are already there want others to join them. That’s why it’s called the Alumni Founders Wall — because their legacy and continued support form the foundation for the next generation of William & Mary entrepreneurs. The wall is the cornerstone, the alumni are the foundation. Let’s take a look at that foundation, checking in with alumni entrepreneurs running ventures from fashion to farming. Below are six stories covering 11 alumni, all of whom are breaking ground and taking risks. Ultimately, as we read these, we look forward to the many stories still left untold. Ever since the age of eight, when she met Diana Ross at a summer gymnastics camp, Kiya Tomlin ’96 has had an eye for fashion. Two years later, with a sewing machine at home, she made her first original piece of clothing: a chambray jumpsuit with tapered legs. Throughout high school, Tomlin made and wore her entire wardrobe. Now Tomlin runs her own brand, based out of her newly opened manufacturing and retail space in Pittsburgh Pennsylvania: the Kiya Tomlin Work/Shop. Her clothes are versatile, with enough fashion for a business event and enough comfort for a trip to the grocery store. She’s been on the cover of Forbes Asia as one of their 30 Under 30. In 2017, she was an invited speaker at Fortune’s Most Powerful Women International Summit in Hong Kong and Microsoft’s CEO Summit. She’s Pocket Sun ’13, and when she arrived in Williamsburg for her freshman year after spending her whole life in China, she didn’t have much confidence. Sun was unstoppable, exploring interests across campus and fearlessly pursuing different projects — one of which became SoGal Ventures, her multimillion-dollar venture capital firm with over 50 companies under its umbrella. SoGal is the first firm of its kind dedicated to investing in female millennial entrepreneurs. “I quickly came to the realization that entrepreneurship is the only way to make a real impact on the world,” Sun wrote in a post on Medium in January 2017. She’s already made an impact; the only question now is what’s next. It was 1997, the early days of the internet. Boyer had realized he didn’t want to be a lawyer his whole life and was searching for answers. The first product of those brainstorming sessions was Snagajob, an online platform for people seeking hourly work that grew into a major success, accumulating over 50 million users during his leadership. Since then, Boyer has been working on different ventures, the latest of which is Go Happy, an internet service that encourages people to make plans face-to-face rather than online. Based in Richmond, Virginia, Go Happy now has over 50,000 subscribers in more than 100 countries, and Boyer, who came up with the idea after examining his own hectic life, is delighted. Actually, he couldn’t be happier. In 2017, Elizabeth Schuette ’80 and her husband John J. Cuticelli, Jr. P ’98 co-founded a luxury animal hotel in John F. Kennedy International Airport in New York. That’s right, a luxury animal hotel — the world’s first privately owned, 24/7 animal terminal and airport quarantine center sitting on more than 14 acres. It’s called the ARK. “We developed The ARK concept to address the unmet needs for the import and export of companion, sporting and agricultural animals,” Schuette said. Coming from the real-estate industry, neither Schuette nor her husband had experience working with animals, but their hotel serves an important need. According to the Department of Transportation, over two million animals travel by air in the U.S. each year. The ARK makes sure those are safe and comfortable in between flights so their owners can rest easy. They’ve even helped some animals, like a black Yorkshire terrier named Jameson, find a home. He arrived abandoned and dehydrated, he left with a name and a family — all in a day’s work at the ARK. There’s something about staying close to home, about investing in the same streets you walked as a kid, about creating a better backyard for the next generation. At least, these six alumni think so. Jim Ukrop ’60, L.H.D. ’99, Cliff Fleet ’91, M.A. ’93, J.D. ’95, M.B.A. ’95, Victor Branch ’84, Hylah Ballowe ’94, Rob Estes Jr. ’74 and Elizabeth Cabell Jennings ’85 are all major business leaders operating out of Richmond, Virginia, just an afternoon drive from their alma mater. After selling the major regional grocer Ukrop supermarkets, Ukrop now runs New Richmond Ventures, a Richmond-based venture capital firm. Fleet — one of about two dozen alumni with four or more degrees from William & Mary — is a former president and CEO of Phillip Morris USA and currently advises Nutriati, a local food company. Branch is the president of Bank of America’s Richmond branch, and Ballowe is on the board of Davenport & Co. Estes, of course, runs the family business: Estes Express Lines, a coast-to-coast shipping company. And Jennings splits her time between Atlanta and Richmond as SunTrust’s Director of Institutional Investments for its Foundations and Endowments Specialty Practice. In a rapidly modernizing city, sailing farther into the 21st century, these six alumni are at the masthead of Richmond’s cultural and business revival. They can’t be themselves without Richmond, and frankly, Richmond couldn’t be itself without them. If you were asked to leave your job in Silicon Valley, California into a 780-square-foot house with your seven-person family and work an 1,800-acre farm, would you say yes? That’s exactly the situation Mary Heffernan ’00 and her family faced just a few years ago when they founded Five Marys Farm in Fort Jones, California. The Heffernans organically raise a wide range of animals on their farm and pack meat products by hand for sale on their national website. The days are long; there’s always something to do, but the work is rewarding. They can always rely on their mission: to raise ethically sourced meats and cut no corners. After all, the Heffernans aren’t just selling meats, they’re selling trust and transparency. It was a risk to start a farm, a dirty one at that, but even in the mud and rain, there’s no looking back. Losing hurts, failure often comes with pain. It’s exactly in those difficult moments, though, that we grow, at least according to Swan. A quarter Scottish and with the first name Scott, he’s been trying to reconnect with his roots by learning the bagpipes for the last year. It’s been one of the most difficult processes ever, he said, navigating something that looks more like an accident than an instrument. But despite the challenge, he continues to play. He has an unreached romantic vision of the Scottish Highlands in mind, and yes, he owns a kilt. Entrepreneurship might have little to do with bagpipes, but it has everything to do with risk and failure. Students at the Entrepreneurship Center face that challenge every day, but they do it with the reassurance that alumni have come before them, succeeded and will help them succeed too. William & Mary alumni, especially in the business world, are known for altruism and kindness, and they never stray too far from the university. Jim Ukrop regularly returns to campus; Shawn Boyer has hired other W&M alumni at Go Happy. The fact is, while everyone wants to join the Alumni Founders Wall, it’s not about the glory. The motivation comes from a commitment to service inside and out of the university — to taking risks, failing and falling, but always moving forward. “After all, they’re more than just names on a wall,” Henshaw said.